Isabella from The Beaded Tail posted about a really awesome Etsy store and she recommended Laura and The Cat in the Clover and the Cat Angels available in her store. Of course, Mommy ordered one of them right away as a memorial to her former Mancat, Muddy. I was a little hesitant because I really like being Mommy's only Mancat. I don't want to share her or my girls with anyone else. 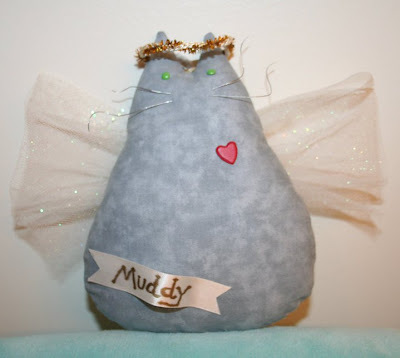 But when the Muddy Cat Angel arrived, it made Mommy so happy. She cried a little bit thinking about Muddy at first, but she said the Angel makes her feel very good. I like the fact that the new Muddy is not very big, so if he gets out of paw, I'll be able to handle him. I'm the head Mancat around here now, you got that? Maybe it won't be so bad having Cat Angel Muddy around. I could use a Mancat friend to hang out with. Besides, he's pretty quiet. Muddy was very handsome and his Cat Angel is very cute! We're glad the Angel makes your mommy feel good. It is a nice way to remember the kitties who came before us. We're also glad you don't mind hanging out with him Samson. You are very handsome too and we are so impressed you didn't test to see if the halo comes off! Samson, it takes a real Mancat to allow another Mancat into the house. Muddy-angel is way cool. We are old friends of the Cat in the Clover lady, from back in our Catster days. Have a good Monday friends! We just love Angel Cat Muddy! What a great way to tribute the one who came before. Muddy is so cute. Mommy will go and visit the site. Have a great day! Muddy was so adorable, like Derry. The angel is sweet, a lovely remembrance. We don't think he'll cause any problems for you, Samson. What a lovely way to remember Muddy. Awww gorgeous Samson!! Of course you are the head mancat - look at you all floofy and adorable and very mancatly! Me and Charlie like Muddy Cat Angel very very much! Isabella is an amazing artist and we are glad that Muddy Cat Angel comforts your mum! Hello too to sweet Delilah and bella Bella! Angel Cat Muddy is terrific. Samson, that is such a good boy to become friends with him. You two look so great together and I bet Mom loves that last picture of you two. We remember that post and need to go back and see about getting some angels for some of ours that have gone now. Awww Samson....don't worry, your Mama loves you too!! You may like using that adorable angel as a pillow! Muddy can watch of you and the family a bit closer now. We think the Muddy Angel is purrfect. And it is always nice to have an angel kitty watching over you, Samson! P.S. That photo of Muddy looks so much like our Angel mancat, Fletcher! What a wonderful way to remember Muddy. I'm very proud that you didn't put the bitey on his Cat Angel. That is a great way to remember Muddy. Samson you are so cool to hang out with him! He is adorable and we're happy he made your mommy happy! AND, now there's TWO ManCats (ish) in the house! Oh we like that Cat Angel!! We wouldn't mind sharing our house with one in memory of the ones that came before us...Bogart and Scooter. We'll hafta have our mom check those out! Samson, you're a good boy for allowing Muddy's angel cat to share some space with you. I'm so happy your Mommy liked Muddy's angel! I've also given you a shout out today on The Cat in the Clover blog! How cute, and a wonderful way for your mama to remember Muddy. We know you and him will get along just fine....and it's always advantageous to have a guardian angel!!!!! It was very good of you to let CatAngel Muddy stay. As long as he remembers you're the chief mancat, everything should be okay. Sampson, a True ManCat knows the value of keeping his Mom happy...you are one True ManCat for sure. That is very sweet! It hardly took any time at all for Samson to get used to Muddy. I think all of us who have lost beloved pets can relate to this. It's a wonderful remembrance of him, and obviously means he's still part of the furmily (though, not the head of it, of course). 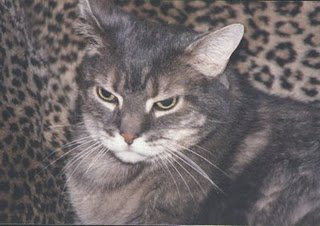 Why, that Cat Angel is perfect, grey and small and very angelic...we don't think he'll give you any hiss!